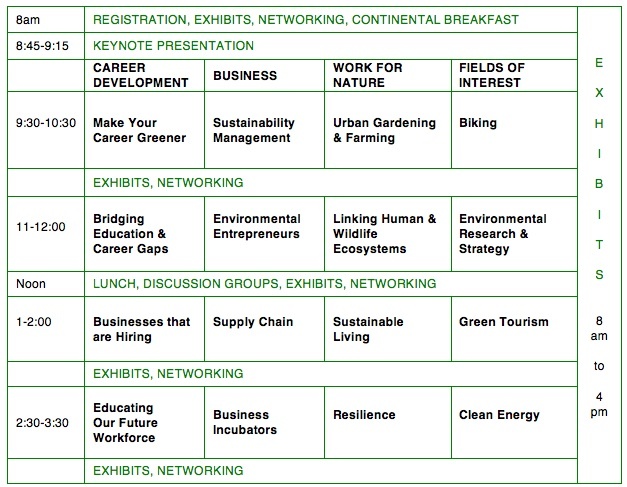 The Massachusetts Green Career Conference connects stakeholders from education, business and nonprofits, and green career ready candidates to advance workforce and sustainable development. Exhibitors offer career resources and job opportunities. Meet exhibitors who are accepting resumes. See job openings below. Click on highlighted names to see presentations. Based on a dramatic battle fought through the Supreme Court The Snail Darter and the Dam (Yale Press) is the classic story of the American environmental movement to protect human and wildlife ecosystems. Hear from its inspiring lawyer and author who proves that environmental-related careers are the foundation for a more sustainable future. Are you ready to transform the life and work you love into something passionate and purposeful? There is no time like the present to make it happen. Sustainability Management – Is it For You? Two sustainability managers describe their careers, work and responsibilities with diverse stakeholders in this growing field. Opportunities for urban and regional food production are growing and are key to future sustainability. Hear about current trends. The world of biking whether for commuter transport, sports, or recreation is moving forward. An expanding infrastructure of trails, products, and services offer a plethora of career opportunities. What do we need to know about navigating career pathways? What can employers and educators do to harness talent? Connecting education and careers requires STEM, internships, co-op education, workforce training programs, and more. Hear from entrepreneurs creating eco-related careers for themselves and others. Learn about start ups and established businesses, and resources that support them. Working to protect and restore native wildlife and habitats is essential for ecological health. Learn about designing effective citizen action initiatives and interactions with government. Hear about opportunities for citizens to carry their environmental analysis into the practical world of government and business. Learn about research, writing, and targeting the right audience to pave the way for policy and social change. Effective communication skills advance environmental causes and one’s own career. Learn about businesses & agencies, current openings, and future prospects. Learn from a supply chain recruiter and a sustainable supply chain manager who work with many stakeholders to reduce the environmental impacts of materials that companies procure, process, and distribute products to consumers. Make a rewarding career from helping others live more sustainably. Hear from rainmakers whose practical solutions create greener horizons for themselves, their clients, and the planet. Learn about the greener side of tourism – food, lodging, mobility, and recreation. Opportunities exist to engage, educate, and employ many people in eco-tourism. How do we mold the next-gen workforce? Real world experience, on-the-job training, placement assistance, and ongoing support offer greater promise for educator, employee, and employer success. Where can you find eco-minded rising business stars? Business incubators provide professional business development services to diverse individuals in the green economy. Learn about the skills and knowledge practitioners bring to the table for urban planning and sustainable development. Urban design and mapping analytics mitigate environmental risks and ensure a safer future. Massachusetts now has 615 MW of solar installed. The State ranked No.2 in the nation in clean energy technology in the “U.S. Clean Tech Leadership Index 2013”. Hear about clean energy policy and job creation in Massachusetts where clean energy jobs are growing. Career development and sustainability coaches will be available at no charge to people seeking guidance in 20 minute one-on-one sessions at the conference. This is a popular feature of our conference. Please come early to sign up. Ticket fee ($40-$90) covers exhibitors, speakers, introductory sessions, coaching, roundtable discussions, breakfast, lunch, and book raffle. Parking and WiFi are FREE. Registration & Info @ http://greencareer.eventbrite.com. Conference Director, Jen Boudrie, JenBoudrie@gmail.com, 508-481-0569.